Ricardo is a MERRITHEW™ Instructor Trainer for STOTT PILATES® and Total Barre® , the first and currently the only one in Cyprus (after he was FULLY CERTIFIED in STOTT PILATES® Matwork, Reformer, Cadillac, Chair, Barrels, Injuries and Special Populations) and is a well-known figure in the Cyprus fitness industry. Originally from Bogota, Colombia, Ricardo started his career as a ballet dancer after his successful studies in dance at ANNA PAVLOVA’s DANCE ACADEMY in Bogota. Through dance he discovered STOTT PILATES® and made a decisive turning point in his life and started practising and studying the method of PILATES. Since PILATES bodyharmony™ studio’s launch in April 2006, Ricardo has studied an impressive series of training and therapeutic courses in Germany, Belgium, Israel and Cyprus. His passion for STOTT PILATES® is the inner power that drives him to become more emerged into the philosophy of the method, transmitting this passion to his students. He is the Manager of Pilates bodyharmony™, the MERRITHEW™ Licensed Training Center in Cyprus, offering the STOTT PILATES® and Total Barre® education courses and workshops. 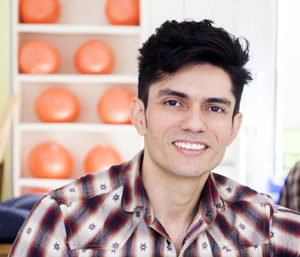 Ricardo teaches the STOTT PILATES® method on group and private classes and works with elite and amateur athletes for performance enhancement and rehabilitation. His work is distinguished by his ability to motivate and inspire his students and clients to reach beyond their capabilities and comfort zone. Moreover, his portfolio includes a series of training and therapeutic courses, including Sensory Motor Learning, Muscle Activation, Trigger Point and fascia release. Ricardo has completed an impressive series of therapeutic workshops including STOTT PILATES® Prenatal, Osteoporosis management, Breast cancer recovery as well as for those suffering from Scoliosis. As a pioneer in the fitness industry, Ricardo also introduced the Zumba® method to Cyprus in 2008 and was the first certified Zumba® instructor to teach regular classes on a weekly basis. Ricardo’s approach to Pilates maintains that the exercises practiced in the STOTT PILATES® method are the vehicle which drives us towards increased awareness, balance, and harmony.